Visuteach provides an online GL Assessment 11 plus maths membership package which helps prepare for GL Assessment 11 plus maths entrance exams and admissions assessments for grammar schools, independent schools and private schools. The membership package costs £10 for one month or £30 for six months. Visuteach’s online 11 plus maths membership package contains ten complete GL Assessment style maths tests which should be completed in fifty minutes. Each of our 11 plus maths tests contains fifty maths questions which are Key Stage 2 level questions similar to, and based upon, the questions in the official GL Assessment familiarisation practice paper packs which are sold online and in shops. Our tests are online multiple-choice tests with automatic and immediate marking, and the questions come with answers and full worked solution explanations which provide tuition and help in solving the problems. 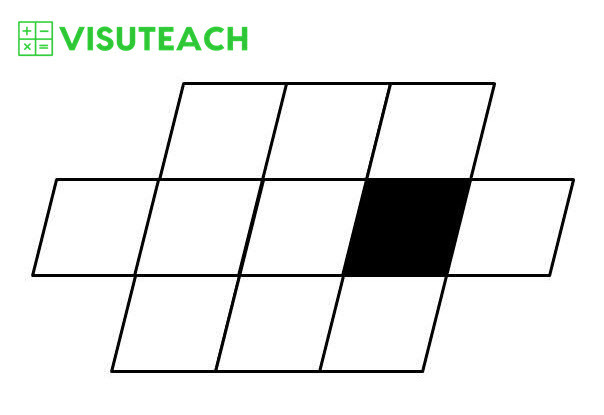 Visuteach’s GL Assessment 11 plus maths membership package contains five hundred GL Assessment style 11 plus maths questions which are presented as ten fifty-minute, fifty-question tests and as fifty ten-minute, ten-question tests. The short ten-minute tests are ideal for daily practice because they require less time to be set aside for learning and because they can be completed quickly. Daily practice reinforces learning and helps grasp and integrate concepts more effectively than less regular practice. This page contains demo computer software of our online 11+ (11 plus) GL Assessment maths membership package for grammar school, independent, private school and secondary school entrance exams. You can download a pdf file of sample maths questions, and answers to these 11 plus sample maths questions are shown further down this web page. 500 online GL Assessment style maths questions. Questions presented as 10 fifty question fifty minute tests as well as 50 ten question ten minute tests. Questions are online only and cannot be printed out. The following two demos are untimed 10 question tests with answers immediately after each question. The following two demos are timed 10 question tests with answers at the end of the test. The questions, answers and explanations are shown in the tabs below. Jack was x years old 4 years ago. How old will he be 6 years from now? 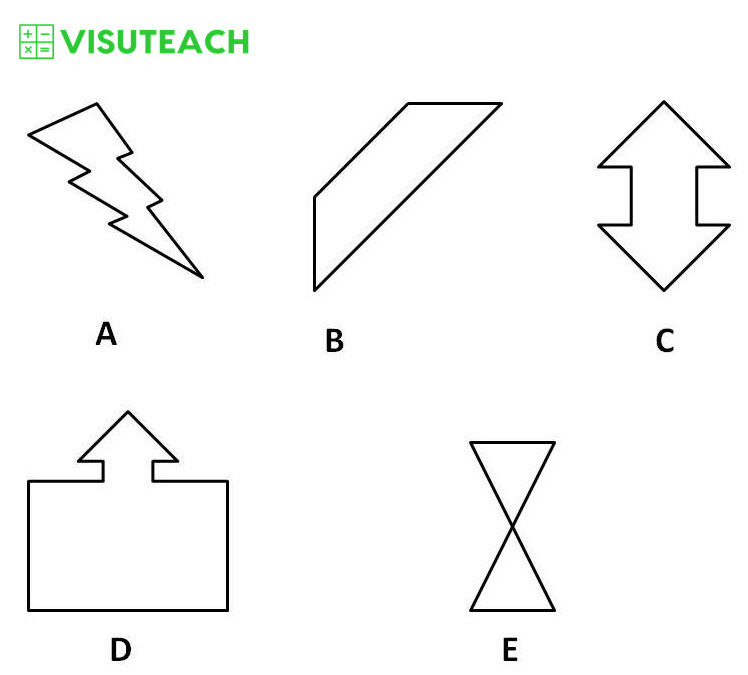 A, B and C are the angles of an isosceles triangle. Angle A measures 70°. Angle B is greater than 60°. What is the size of angle C? An isosceles triangle has at least 2 equal sides and 2 equal angles. We also know that the angles inside a triangle add up to 180°. 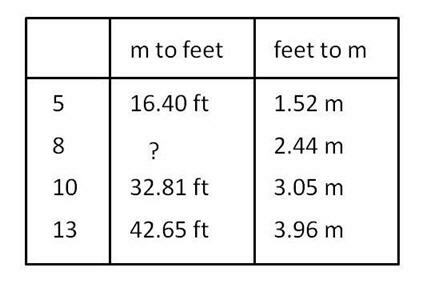 The table shows some values in a conversion table of metres to feet and feet to metres. 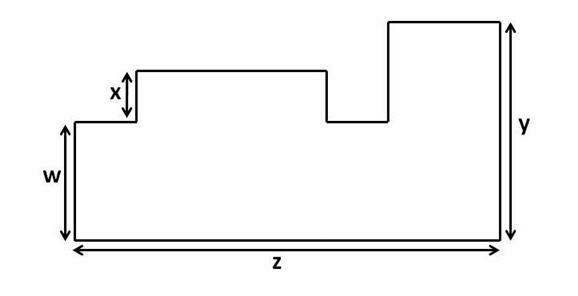 From the table you can see that 5 m = 16.4 feet and that 5 feet = 1.52 m. What figure should replace the question mark? Which of these shapes have rotational symmetry? shape A has rotational symmetry of order 2 (i.e. it fits onto itself twice as it is turned through 360°). 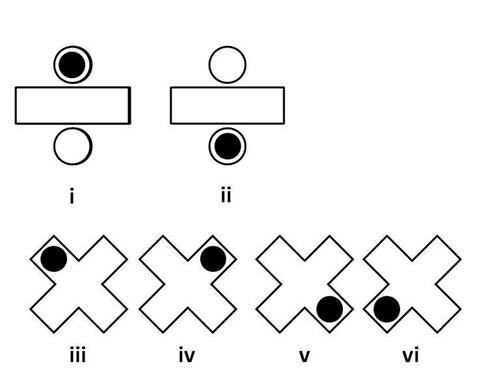 This can be seen in (i) and (ii) above. We have put a blob on the shape in order to more easily see what happens when we rotate the shape. We start from position (i) and end up at position (ii) after rotating the shape 180° clockwise. From position (ii) we end up back at position (i) by rotating the shape a further 180° clockwise. So there are 2 positions in which the shape looks the same when being rotated through 360° and therefore shape A has rotational symmetry of order 2.
shape C has rotational symmetry of order 4 (i.e. it fits onto itself four times as it is turned through 360°). 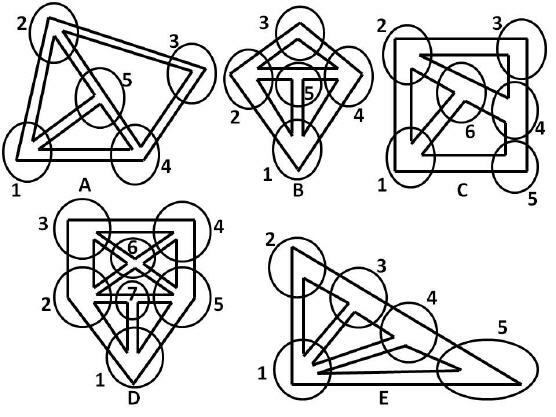 This can be seen in (iii), (iv), (v) and (vi) above. We have put a blob on the shape in order to more easily see what happens when we rotate the shape. We start from position (iii) and end up at position (iv) after rotating the shape 90° clockwise. From position (iv) we end up at position (v) after rotating the shape 90° clockwise. From position (v) we end up at position (vi) after rotating the shape 90° clockwise. From position (vi) we end up back at position (iii) after rotating the shape a further 90° clockwise. So there are 4 positions in which the shape looks the same when being rotated through 360° and therefore shape C has rotational symmetry of order 4. If 5x – 6 = 7x + 4, what is x? to solve for x you need to isolate all of the x terms on one side of the equation. Performing the same operation on both sides of an equation leaves the equation unchanged (i.e. the equality still holds true). We use this fact to help us isolate x terms. First we subtract 5x from both sides of the equation i.e. 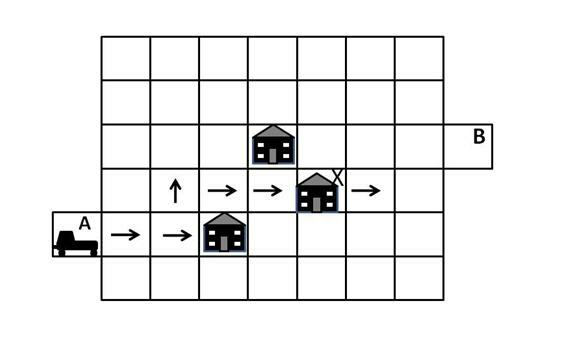 A radio controlled car needs to be guided along the white squares from point A to point B, avoiding the houses on the way. The car can only move FORWARD, TURN RIGHT 90° and TURN LEFT 90°. Which instructions should you use to guide the car? The car moves forward 2, so it moves from position A to position 1. The car is then facing towards the east as shown by the arrow in the square at position 1. The car then turns right 90° (i.e. it turns 90° in a clockwise direction), so it is now facing south. It then moves forward 1 and ends up in position 2. The car then turns left 90° (i.e. it turns 90° in an anti-clockwise direction), so it is now facing east. The car then moves forward 4 so it ends up at position 3. The car then turns left 90° (i.e. it turns 90° in an anti-clockwise direction), so it is now facing north. 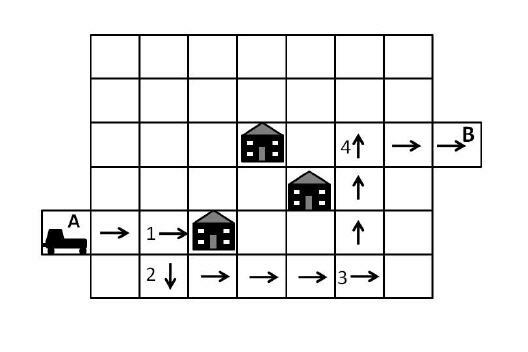 The car then moves forward 3 so it ends up at position 4. The car then turns right 90° (i.e. it turns 90° in a clockwise direction), so it is now facing east. The car then moves forward 2 so it ends up at position B. The diagram shows exterior angles for 5 regular polygons. 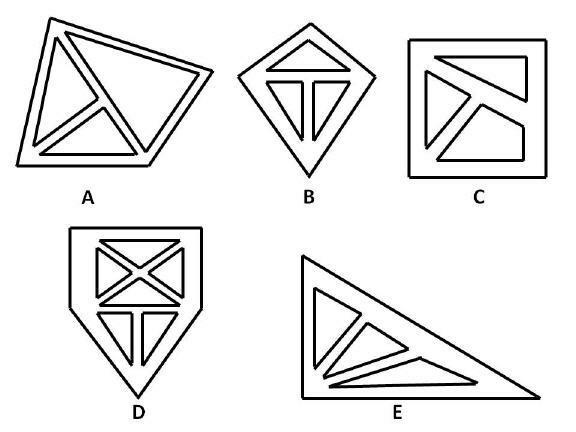 Which one of these angles is the smallest? b) the sum of the exterior angles of any polygon is 360°. A polygon with n sides has n interior angles and n corresponding exterior angles. For a regular polygon, all of its interior angles are equal to each other and also its exterior angles are equal to each other. For a regular polygon with n sides, each of its n exterior angles is equal and the sum of its n exterior angles is 360°, so each exterior angle will be equal to 360°/n. Therefore the larger the value of n, the smaller the value of the exterior angle (e.g. if n = 3 then each exterior angle will be 360/3 = 120° and if n = 6 then each exterior angle will be 360/6 = 60°). So the regular polygon with the greatest number of sides will be the one that has the smallest exterior angle. The octagon has the most sides and therefore the answer is E (i.e. angle E). 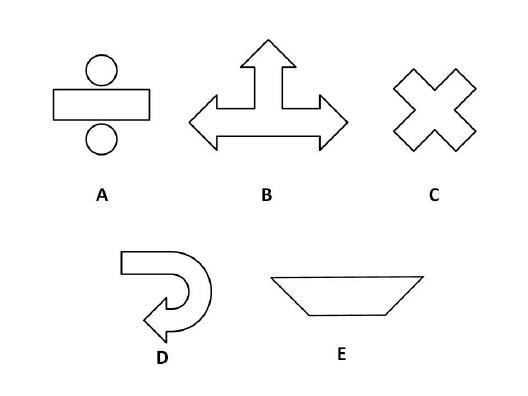 How many of these shapes contain interior reflex angles? A milkman delivers milk to certain housing estates. 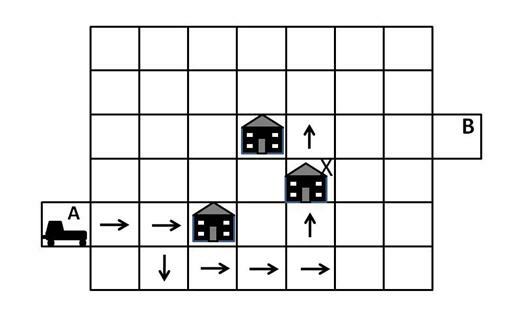 The street layout of the housing estates is shown in the diagram above. The milkman wants to avoid visiting the same street more than once, but there are no restrictions on him passing over the same street corners. On which housing estate is this possible? 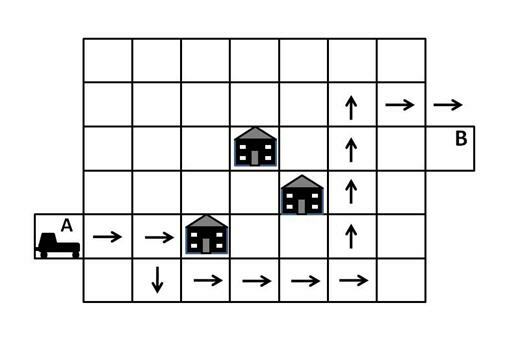 You can solve this problem by trying to trace a path through the streets of each housing estate and finding the housing estate that allows the milkman to visit each street once only. However, there is a quicker, easier way to work the problem out. We will first define a vertex as being a point at which paths (i.e. streets in this example) meet. The degree of the vertex is the number of paths that meet at the vertex. The degree of a vertex is odd if there are an odd number of paths meeting at the vertex, and is even if there are an even number of paths meeting at the vertex. If there are fewer than 3 vertices of odd degree then there is a path around the housing estate which allows the milkman to visit each street once only. If there are more than two vertices of odd degree then there is no path around the housing estate which allows the milkman to visit each street once only. So the solution can be found by eliminating any housing estate that has more than 2 vertices of odd degree, and looking for the housing estate that has fewer than 3 vertices of odd degree. A is incorrect because housing estate A has 4 vertices of degree 3 (i.e. vertices 1, 2, 4 and 5) and 1 vertex of degree 2 (i.e. vertex 3). Therefore it has 4 vertices of odd degree and 1 vertex of even degree. It has more than two vertices of odd degree and is therefore not the correct answer. B is incorrect because housing estate B has 4 vertices of degree 3 (i.e. vertices 1, 2, 4 and 5) and 1 vertex of degree 2 (i.e. vertex 3). Therefore it has 4 vertices of odd degree and 1 vertex of even degree. It has more than two vertices of odd degree and is therefore not the correct answer. 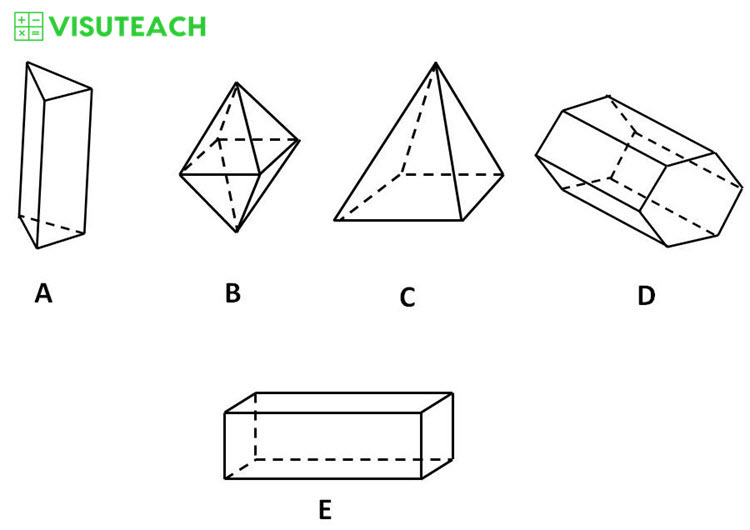 C is incorrect because housing estate C has 4 vertices of degree 3 (i.e. vertices 1,2,4 and 6) and 2 vertices of degree 2 (i.e. vertices 3 and 5). Therefore it has 4 vertices of odd degree and 2 vertices of even degree. It has more than two vertices of odd degree and is therefore not the correct answer. D is incorrect because housing estate D has 4 vertices of degree 3 (i.e. vertices 1, 3, 4 and 7) and 3 vertices of degree 4 (i.e. vertices 2, 5 and 6). Therefore it has 4 vertices of odd degree and 3 vertices of even degree. It has more than two vertices of odd degree and is therefore not the correct answer. 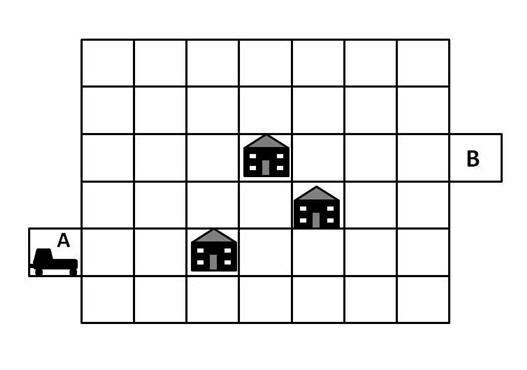 E is correct because housing estate E has 2 vertices of degree 3 (i.e. vertices 3 and 4), 2 vertices of degree 2 (i.e. vertices 2 and 5) and 1 vertex of degree 4 (i.e. vertex 1). Therefore it has 2 vertices of odd degree and 3 vertices of even degree. 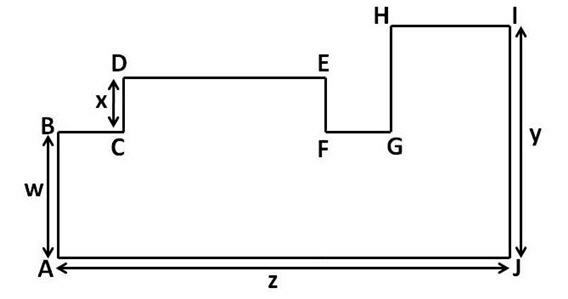 It has fewer than 3 vertices of odd degree and is therefore the correct answer. In summary, to solve these problems quickly, all you need to do is to eliminate any housing estate that has more than 2 vertices of odd degree. The solution will be the housing estate that has fewer than 3 vertices of odd degree. vertex 3 to vertex 2, vertex 2 to vertex 1, vertex 1 to vertex 3, vertex 3 to vertex 4, vertex 4 to vertex 1, vertex 1 to vertex 5 and vertex 5 to vertex 4. Carol has 23 photo albums, and each album contains 480 photos. How many photos does she have in total? Anthony draws a plan of his house using a scale of 3 cm to 7 m. The kitchen has a length of 7.5 cm on the plan. What is the real length of the kitchen? 3 cm on the plan represents 7 real metres. The kitchen has a length of 7.5 cm on the plan. The area of the black parallelogram is 30 mm². 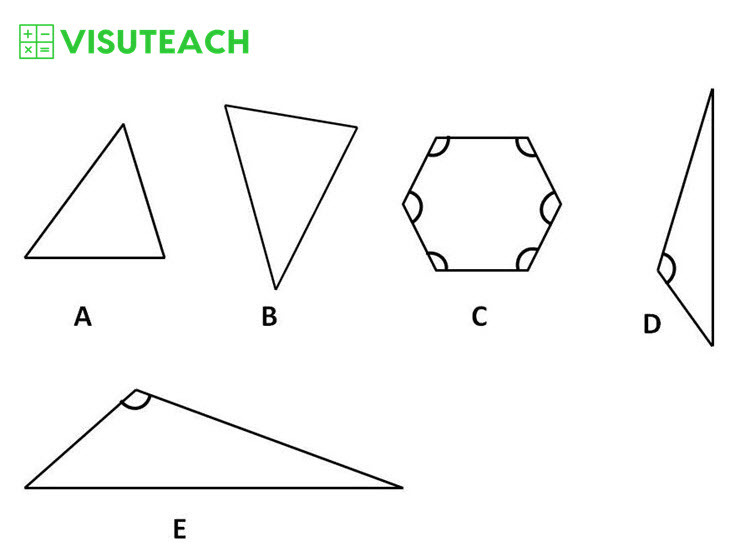 What is the area of the large shape? The large shape is made up of 8 parallelograms of equal size. Each parallelogram has an area equal to the area of the black parallelogram (i.e. 30 mm²). So the total area of the shape is 8 x 30 mm² = 240 mm². Jack is looking at the dessert menu at a restaurant. There are 3 types of ice cream, 5 types of sorbet and 2 types of tart. Jack decides that he will have an ice cream, a sorbet and a tart. How many possible combinations of ice cream, sorbet and tart can Jack choose from? For each type of ice cream, there are 5 types of sorbet. There are 3 types of ice cream and therefore there are 15 (i.e. 3×5) combinations of ice cream and sorbet. For each one of these 15 combinations of ice cream and sorbet, there are 2 types of tart. Therefore there are 30 (i.e. 3x5x2) combinations of ice cream, sorbet and tart. 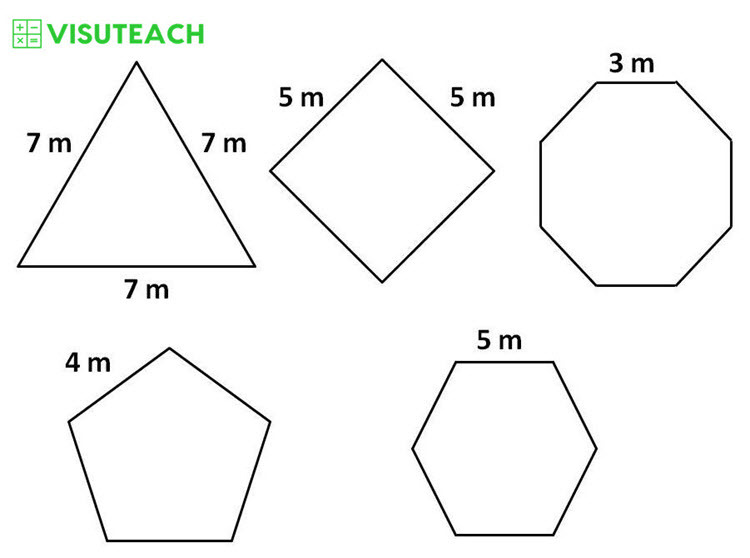 How many of these shapes have a perimeter greater than 20 metres? Shapes A, C and E have perimeters greater than 20 m. So there are 3 shapes that have perimeters greater than 20 m.
How many of these shapes contain obtuse angles? 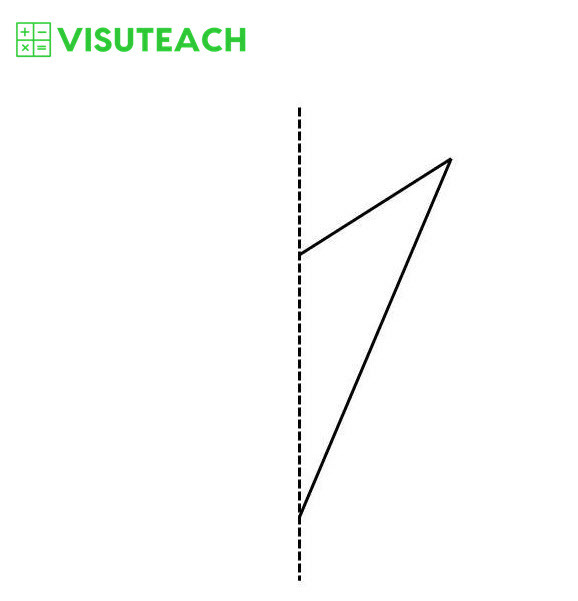 Shapes, C, D and E contain obtuse angles, and these angles are marked in the diagram above. 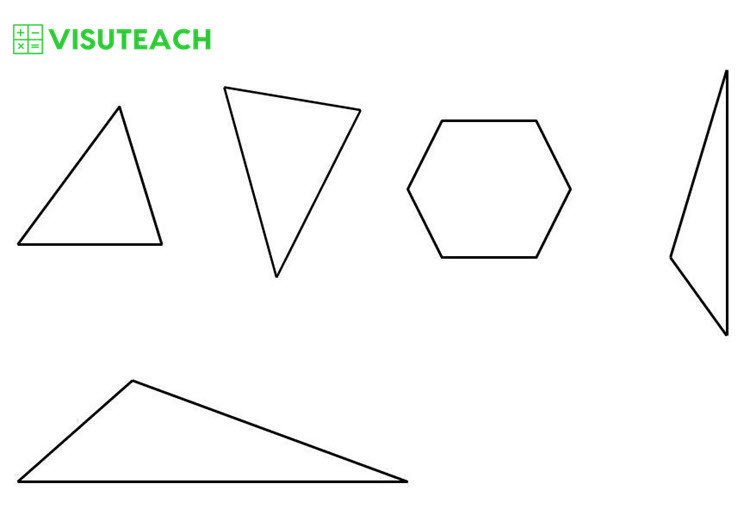 So there are 3 shapes that contain obtuse angles. 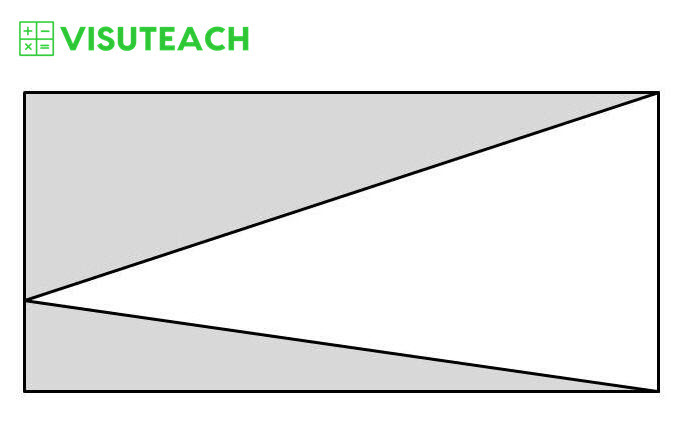 The diagram above shows part of a shape and its line of symmetry. What is the name of the complete shape? 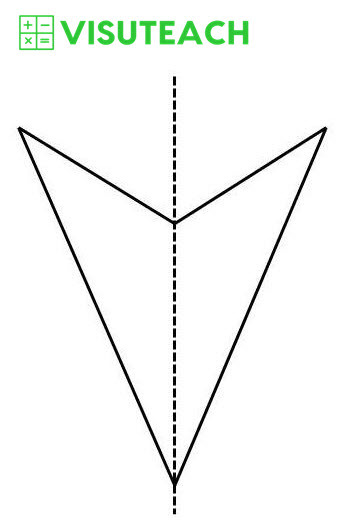 The complete shape is shown above and is called a kite. Shapes C and E have rotational symmetry of order 2 (i.e. they each fit onto themselves twice as they are turned through 360°). Each of these shapes fits onto itself when rotated by 180° and then fits onto itself again when rotated a further 180°. So there are 2 times in which each of these shapes looks the same when being rotated through 360° and therefore each of these shapes has rotational symmetry of order 2. The other shapes do not have rotational symmetry. The area of the white triangle is 46 cm². What is the area of the shaded part of the rectangle? 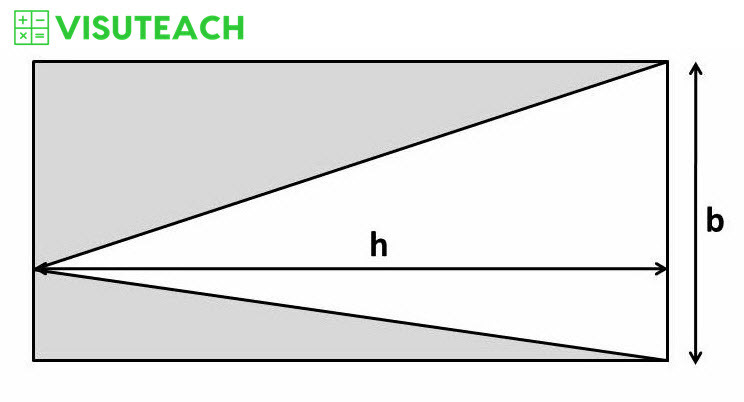 The area of the rectangle is bh and the area of the white triangle is ½ x base of the triangle x perpendicular height of the triangle (i.e. ½bh). So the area of the rectangle is twice the area of the white triangle. How many shapes have more vertices than faces?